Large gantry mechanisms on either side of the Soyuz TMA-08M spacecraft are raised into position to secure the rocket at the launch pad on Tuesday, March 26, 2013 at the Baikonur Cosmodrome in Kazakhstan. Liftoff is set for March 28 EDT (March 29 Local Time). Three men are poised to make history today when they blast off on a rocket ride today (March 28) that will reach the International Space faster than any astronauts to fly there before. NASA astronaut Chris Cassidy and Russian cosmonauts Alexander Misurkin and Pavel Vinogradov are due to arrive at the orbiting laboratory just six hours after they launch at 4:43 p.m. EDT (2043 GMT). The liftoff will begin a months-long mission in orbit for the three men. At the Gagarin Cosmonaut Training Center in Star City, Russia, Expedition 35/36 Flight Engineer Chris Cassidy (right), Soyuz Commander Pavel Vinogradov (center) and Flight Engineer Alexander Misurkin clasp hands for photographers prior to the start of qualification simulation runs in a Soyuz spacecraft mock-up on March 5, 2013. The three crew members are training for launch March 29, Kazakh time, to the International Space Station in their Soyuz TMA-08M spacecraft from the Baikonur Cosmodrome in Kazakhstan. 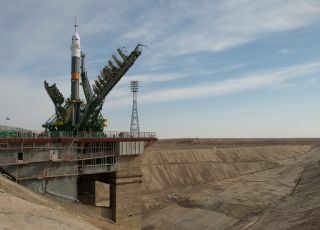 The trio will blast off from the Central Asian spaceport of Baikonur Cosmodrome in Kazakhstan aboard a Russian Soyuz spacecraft. The mission's Soyuz rocket rolled out to the launch pad on Tuesday (March 26) to prepare for today's liftoff. You can watch the launch live here on SPACE.com's NASA TV feed beginning at 3:30 p.m. EDT (1930 GMT). The quick journey, which takes just four orbits of Earth, has been carried out by recent unmanned cargo spacecraft visiting the space station, but never by a crew. "The four-orbit rendezvous has the advantage of a very short period of time from launch to docking," Mike Suffredini, NASA's International Space Station program manager, said of the mission. "It reduces the amount of time the crew has to spend in a small environment before they get to ISS." Cassidy, Misurkin and Vinogradov are planning to join the station's Expedition 35 mission for a roughly six-month stay. The current residents of the outpost are commander Chris Hadfield of Canada, Russian cosmonaut Roman Romanenko, and NASA astronaut Tom Marshburn. "It's shaping up to be a really exciting expedition — we've got a lot going on," Cassidy, 43, said. "We're very excited to join our friends and colleagues Roman, Chris and Tom on the space station." The crew's time will be filled with science experiments, space station upkeep, and visits from visiting robotic cargo delivery spacecraft. Both the Russian cosmonauts, and possibly the American crew, will conduct six spacewalks during their mission for space station maintenance. "It's a very fun and very interesting activity for us," Misurkin said of spacewalking. "During these tasks we are doing to install some scientific equipment outside of the station, and also we are going to prepare some special stuff for the Russian module which will come a little bit later." Misurkin, 35, will be making his first trip to space, while Cassidy and Vinogradov are veterans. Cassidy flew on the STS-127 space shuttle mission in 2009, while Vinogradov served on two long-duration missions, including a stint on the International Space Station in 2006. "Going back to the International Space Station feels like going back home," Vinogradov, 59, said. "I recognize the station is completely different from what it was when we were there. I think this is my second favorite place besides my home." Cassidy, too, said he was looking forward to returning to space, and would relish the chance to see his hometown of York, Maine from orbit. "Flying over my home town — that, I'm really excited about," Cassidy told SPACE.com in a preflight interview. "I come from a small town in Maine and there are a lot of people watching and that brings me a great amount of pride." Follow Clara Moskowitz @ClaraMoskowitz and Google+. Follow us @Spacedotcom, Facebook and Google+. Original article on SPACE.com.